With the Cross Beam jib, long or wide loads can be handled all off the one attachment. Our Cross Beam Jib offers the dual flexibility of supporting a load along the forklift truck length like a traditional forklift jib or lifting a load at right angles to the forklift truck, like a spreader beam. With the Cross Beam jib, long or wide loads can be handled all off the one attachment. When in the jib arm position, the lifting capacity of the beam is 500kg and when in the spreader beam position, the lifting capacity of the beam is 2000kg. Beam length and width is 2000mm. 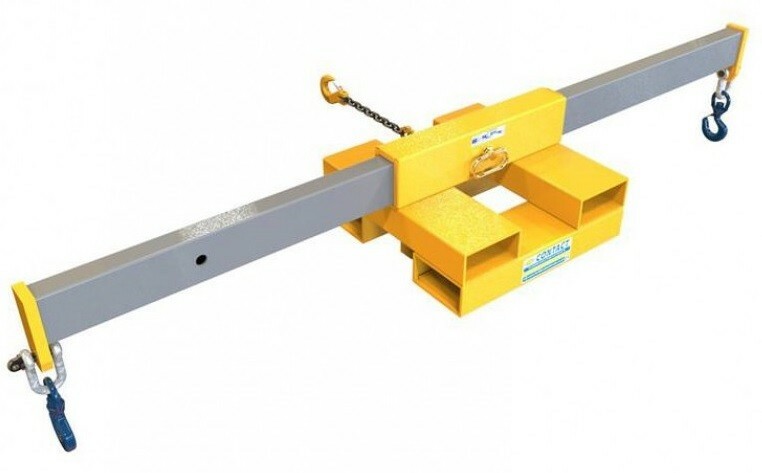 A safety chain secures the Cross Beam jib to the lift truck forks. Supplied with two hooks and shackles, like all our forklift attachments, the Cross Beam forklift jib will come fully tested and certified to comply with the latest Health & Safety Regulations.